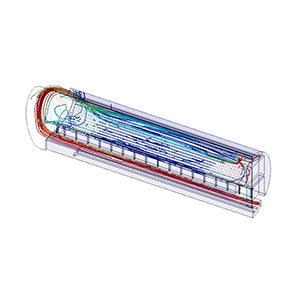 FEA-Solutions (UK) Ltd - Finite Element Analysis For Your Product Design | 054: Airflow and Heat Transfer in Autoclave Flow and heat transfer analysis (CFD) of the air volume in an Autoclave. We completed this analysis within 3 weeks, as another consultancy contracted before were unable to provide results after 6 months. Recommendations based on our results helped to improve temperature uniformity.